Double Yellow Headed Amazon parrots, Amazona ochrocephala oratrix, are beautiful Amazons that are mostly green with varying amounts of yellow on their heads and necks and varying amounts of red on their shoulders. Juveniles have very little yellow and are often mistaken for other species of Amazons. Typically the yellow molts in over a period of about ten years. Their range in the wild is on the Pacific slope of central Mexico down into the Yucatan Peninsula. Double Yellow Heads range in size from 13-15 inches and weigh between 400 and 500 grams. Double Yellow Headed Amazons are a dominant species closely related to the Yellow Naped Amazon. They are excellent talkers and love to sing anything from Sesame Street to opera. They are very outgoing and playful, and enjoy shredding anything they can get their beaks on. They love to swing and play with toys, and they will occasionally get really excited and beat up their favorite toy with great enthusiasm. They are eager to please and respond well to praise and appreciation. They are noisier during feeding times in the morning and early evening, and often go into “talking jags” when they will repeat continuously everything they know how to say for an hour or more. They are highly intelligent and need firm boundaries set in order to keep them well behaved. Double Yellow Heads tend to be aggressive during breeding season in the early spring. They are expressive, bold and excitable, and when their hormones are raging they can more easily become overloaded. Read more about this behavior on our Amazon parrots page. Closely observing their behavior and respecting their emotional honesty is essential in dealing with these expressive birds. If you are willing to be compassionate and respectful of their wild natures, if you are willing to set firm boundaries that can help them manage their behavior, Double Yellow Headed Amazons are flexible, easy to live with, extremely entertaining companion parrots. 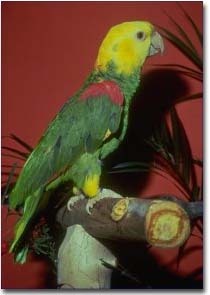 Spectacular coloration, bold and energetic personalities and the potential to talk and sing very well make Double Yellow Headed Amazons wonderful lifetime companions.